When purchasing a used car in Maine, getting a vehicle history report can you help you reveal vital information about the car such as rebuilt title or odometer rollbacks. You can also check if the vehicle is flood-damaged. All motor vehicles bearing a Maine registration must have a current license plate before being operated on any public roadway. Registration plates, displayed horizontally, must be attached to the front and back of the vehicle. Registration plates must always be plainly visible and legible. The registration decals must be placed on the right side of the rear license plate. If your license plates are lost or mutilated, you need to submit a Notice of Loss of Number Plates and Request for New Plates at a BMV office. Replacement plates can be furnished by paying the fee of $5 for each plate plus the cost of validation stickers. Maine offers the following types of specialty plates each with its own criteria and fees. Vanity plates are available at any BMV branch office for registered vehicle owners of Maine who wish to display a personalized license plate on their vehicle. You may check the availability of a vanity plate and order it online. You can transfer your Maine license plates to your new vehicle if you apply for a registration of your new vehicle in the same year you revoke the old registration. The Transfer Plate Fee is $8.00. Maine residents who own a motor vehicle are required to register and title their vehicles before they can be driven on public roadways. Motor vehicles operated on Maine’s public roadways must be insured and inspected annually. 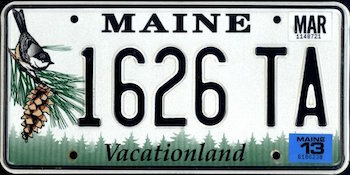 All motor vehicles, 1995 model year or newer are required to have a title in the State of Maine. A motor vehicle must have a title before it can be registered in Maine. For new residents, Maine law requires that vehicle owners must apply for registration of vehicle within 30 days of establishing residency. Buying a used car in Maine? Don’t make a costly mistake. Run a Free License Plate Lookup for your Maine-registered vehicle! Run a Free Maine License Plate Lookup to uncover the full-story of your Maine-registered vehicle.